Acupuncture is an age-old form of holistic medicine. The benefits of acupuncture are well known but not well understood. 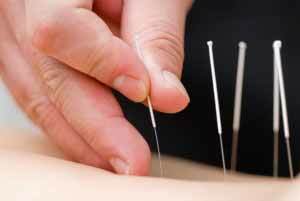 If you ask an average person about acupuncture, they will likely only be able to mention that it involves needles being placed on various parts of the body. In truth, it is a holistic form of medical treatment that uses certain points in the body to treat different ailments, both physical and mental. The benefits of acupuncture arise from the direct interaction of qualified acupuncturists at Oriole Physiotherapy & Rehabilitation Centre with the body’s internal energy. Oriole acupuncturists have a strong belief that illness is caused by a blockage of the body’s natural energy. It can also be a result of lessened or weakened energy in a person’s body. When in a negative state of energy, a person is left open to sickness and mental strife. Acupuncture benefits are provided by rebalancing the flow of energy via needles inserted into various “acu-points” on the body; these points chosen are directly related to the specific illness a person presents. Proper treatment by a trained professional will give adequate relief to the energy issue with the intent of healing the illness. What are the benefits of Acupuncture at Oriole Physiotherapy & Rehabilitation Centre? Many people unfamiliar with acupuncture treatment have questions about its benefits and how it can heal or improve certain maladies. Extensive clinical trials have proven that patients suffering from a wide assortment of problems have experienced real health benefits. Conventional doctors also recommend the treatment before opting for heavy medication. Acupuncture is well known as an accepted form of pain management. As a result, acupuncture not only relieves pain, but it can also limit the amount of chemicals or medications you put in your body. It is also regarded as an effective treatment of many ENT issues such as asthma and sinusitis. There are many other ways that acupuncture benefits the recovery of a person from an illness or injury. The introduction of chemicals, in the form of conventional medicine, has the side effect of depressing other natural responses in the body that stimulate healing. The less amount of chemical present in the system, the faster a person is able to recover. Acupuncture is a good way to increase blood circulation, which will in turn reduce stress on the body and mind. The immune system is bolstered by acupuncture; this allows you to better fight seasonal colds, the flu, and other infections. Many patients who undergo surgery opt for acupuncture as a way to limit nausea and vomiting associated with post op. While there are simple medications for the post op symptoms, there are a lot of people who choose the least chemical approach. This also encourages a person to feel more vital and gain their sense of self much quicker after a procedure. There are no side effects from properly administered acupuncture; however, if done by an untrained practitioner, nerve damage could be an unwanted result. Book an appointment today with one of our Acupuncturists in Willowdale!